Sand Cave Trail Work - Humans Continue to Change the Park. The New Sand Cave Trail. Mid July, 2007, marks a new era at Wyalusing State Park. Devastating rain throughout the night created opportunity for the park. Now, nearly two years later, with the help of grants from the State of Wisconsin, the Friends of Wyalusing, and a state trail crew, one trail, Sugar Maple Nature Trail, has been rebuilt with a new section added. Sand Cave Trail has been redesigned and started. 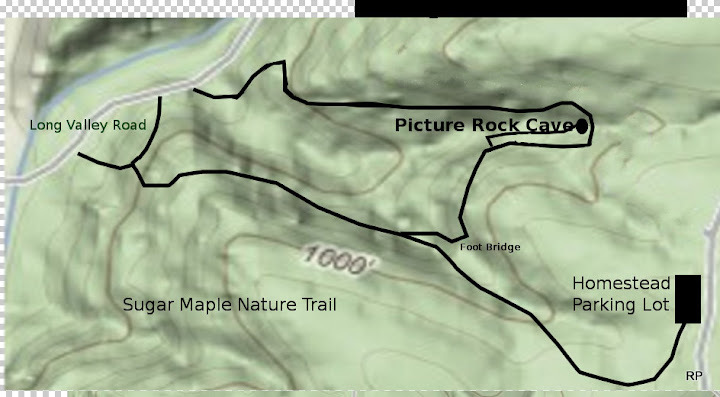 Another trail, yet to be named, is in the works. New Sand Cave Trail (Unofficial) Click to enlarge. From the top of Sand Cave, the trail takes a northerly path along the bluff towards the Wisconsin River. 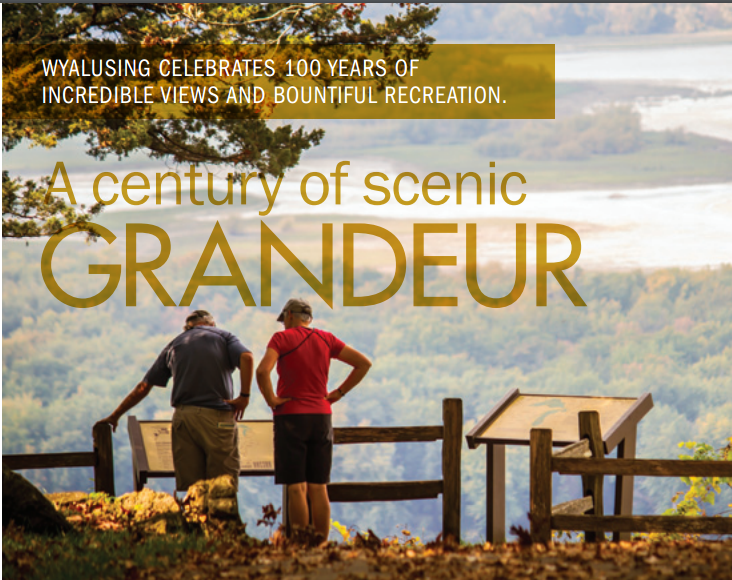 When completed, the walker will be rewarded with vistas of the Wisconsin River valley. This section of trail will be fairly level, following the bluff contour. This section of trail features rock outcroppings and view of the valley below. As the trail wraps around the northern most point of the bluff and turns in a south easterly direction, the walker will have the opportunity to view a creek winding its way along the valley to the Wisconsin River. Once again, there is only a slight change in elevation as the bluff contour is followed. The next section of trail, the final third, will offer a gentle change in elevation as it continues to meet up with Walnut Springs trail, about 200 feet from the beginning. The new Sand Cave Trail is not opened to the public. Only a few sections, at this time, have been carved from the hill side. The trail crew is making steady progress through the clay soil. All are hopeful that part of the trail will be ready by fall. Sign up for instant notification via email, twitter, or Facebook. How Humans have Changed Wyalusing State Park. Bruce Klang, a retired Wyalusing State Park Ranger, recently lead a group of campers on a short walking tour of the park between the Peterson Shelter and the old park office. The hour long program featured the construction of The Peterson Shelter and Nature Center, Wisconsin Ridge Campground, Big Stinky, Mound Building, the CCC, the WPA, Camp Nelson Dewey, and the early development of the park under Robert Glen Jr. and Paul Lawrence. The program is one of several held throughout the Summer at Wyalusing State Park. The programs are sponsored by The Friends of Wyalusing. All are invited to attend. Vehicle admission to the park is required. See the calendar for future events. Spirits of Wyalusing will, once again, be held on the last Saturday of September.